The Panther Jet has always been one of my favorite ever since I built the Monogram Speedy-Built kit back in the day. Just like the cars in the fifties, these jet where just plain down-right beautiful. Really nice work, Jack. The Monogram Panther is one of those kits that will never go bad. Interesting “non Toko-ri” markings for the Golden Dragons, too. I think it was for a military exercise in 1954, as I recall. Really nice. I agree that it is a good looking aircraft. Dis you make your base? Yes…. the base is printed and embossed on cardboard which I glued to a wood base I purchased at Michaels. The Panther looks great! The early jets are simply Cool looking AC-Nicely done. Absolutely beautiful job. 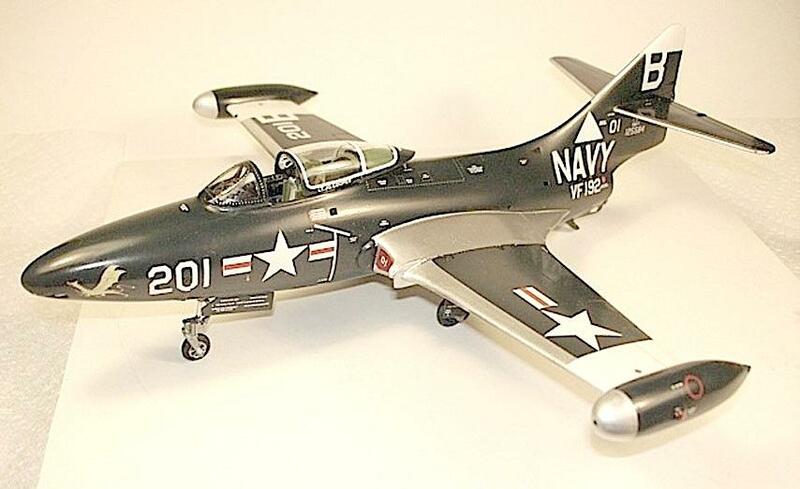 I agree, the F9F was a gorgeous airplane. One of those fine looking Grumman birds. I also built a number of the Speedie Built kits long ago. I also remember the Panther the first time I saw the Blue Angels fly. 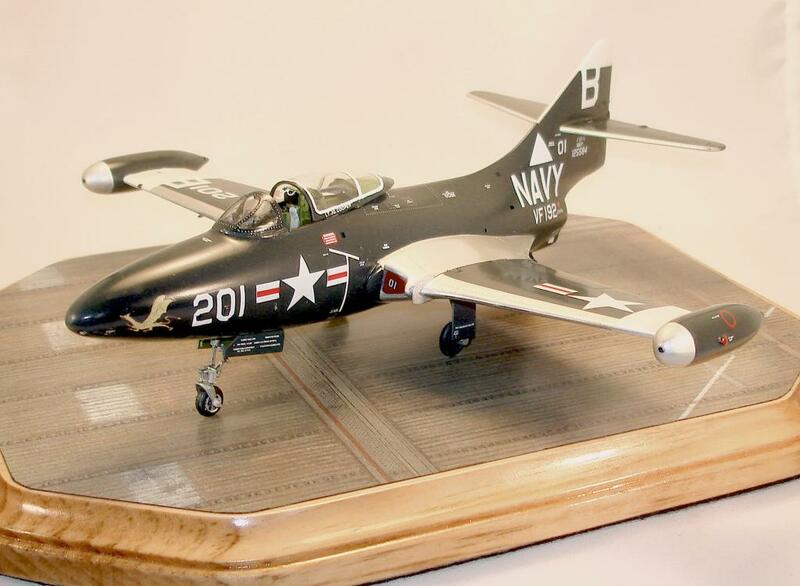 You did this airplane proud with this model. Great Job, nice to know you are ‘keeping your hand in’, Jack.Are you going to takle the new Skywarrior kit? Which Skywarrior kit is that? The Trumpeter 1/48 kit, There has been quite a bit of aftermarket stuff released for it, I remember it was one of your favorite aircraft. Outstanding work, Jack! The Panther is one of my favorites, too, with its’ elegant, classic lines. Your build really brings that out. Ya dun gud, Jack….nice build. Yup, she’s a beaut! Great job on a real “classic”, in every sense of that word! I’m pleasantly surprised by the responses on this model….maybe building the older kits is not a bad idea. I still have a lot of old kits on hand. Lovely paint finish on a great evergreen model. 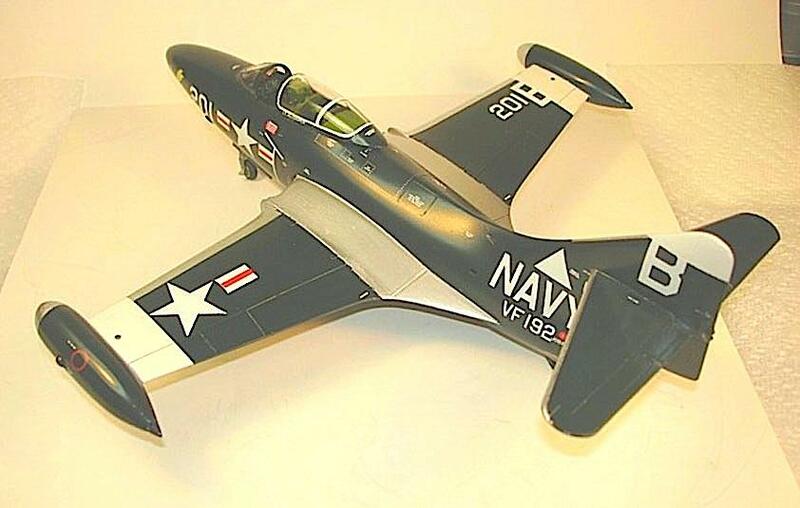 There’s something about US Navy blue & 1950’s aircraft. Just a superb job. Looks like you got the jackpot with this one, Jack, it’s a little beauty.